More like The Crate and us versus Leo. I wouldn’t say the first night went completely smooth, but Leo only cried 4 times throughout the night, and he didn’t eliminate in the crate, so I’d call that a success. We put the crate in our bedroom at the foot of the bed and played a Soothing Dog Sounds playlist from Spotify all night. We filled the crate with a snuggle buddy, puppy blanket, chew toy, and squeaky toy. To be honest, though, I think our saving grace was the snuggle buddy my boss (thank you!!!) suggested we get for him. It’s a little stuffed dog with a battery-powered heart that beats for 8 hours. You can also put a heat pack into it that lasts 12 hours. It’s supposed to remind him of his mom. To this day we use the snuggle buddy, and Leo loves it! He likes to lie on top of it when it’s bedtime. The next day, in efforts to continue crate training, we fed him his breakfast in the crate, which he didn’t seem to mind. He was probably just happy to get some food. 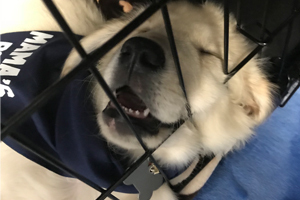 Later in the day, we tried putting him in the crate again (with plenty of treats and “good boys”) after a potty break, and that did not go well. At all. Leo was 100% unhappy, and our sweet, quiet puppy went into full-on whining, crying, and howling mode. Eventually, he quieted down and passed out. Now, a week later, it’s pretty hit or miss with the crate. Sometimes he’ll happily go in and stay quiet, and other times he’ll whine for a bit. The other night, he actually went in the crate by himself and settled in for a nap! It took all of our restraint to not to jump for joy so as to not rile him up again. It’s all about the little victories in our home now. We’re hopeful Leo continues to see his crate as a safe haven he can go to whenever he wants. How long did it take you to crate train your dog? Let me know in the comments below! ← How does 1-800-PetMeds work? GAIA, is a rescue, and was 3 when we got her. Shepherd/Corgi mix. (looks like the world’s biggest long-haired red dachsund). At first we made the mistake of crating at our convenience, like when we left the house or company came. She’s about 45 lbs. so her crate is large. We began leaving the crate open with her blankie, chew toy and a water bowl, all in an area we come and go in. We then began giving her, her vitachew in the crate. (The shepherd in her could chew through a 2×4 in a heartbeat.) With a house full of rescued cats (which by the way she considers HERS!) 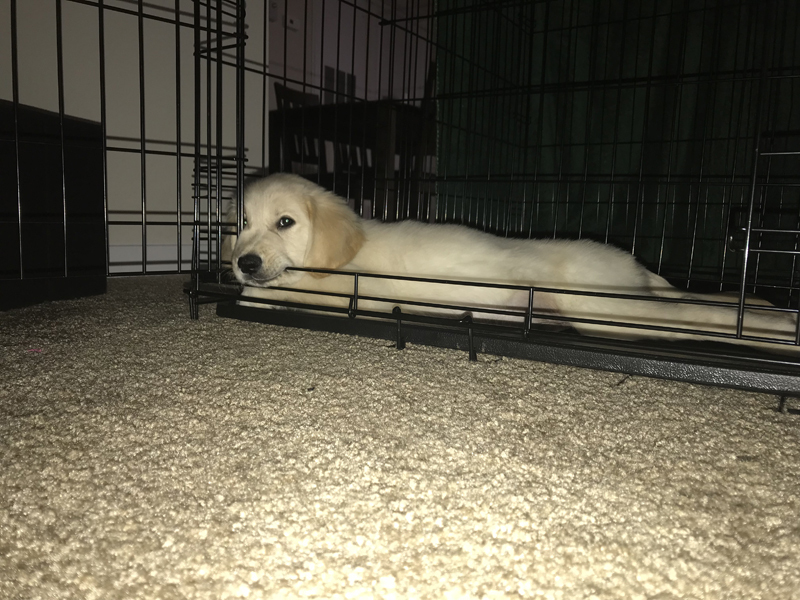 she began to choose the crate as her spot to chill out. We began to use loving friendly voice tones to refer to it as “your house” and it’s the only place she gets her treat. Now, at the age of 6, she adores her house! Break out the treat, she takes off! We leave after saying, “we’ll be right back” and close the door. She’s like, yeah, whatever and hasn’t soiled the crate since we moved it into mainstream and treated it like no biggie, but her space. When we first got her it was a struggle to assure her that outdoors was the place to “go”. But not in her house! LOOOVE this girl!! almost ten years old. He too, loves his Buddy. Part of Buddy’s ears are missing and he has a hole in his back, but Benni brings him outside to lay in his holes. I do not like crate training ! I think is inhuman and unnecessary ! I have had dogs for many years, never had to resort to this ! And worked a job with my babies in the house ! It takes dedication and love to train a dog ! They are smart and understand , if you just give time and love ! I have crate trained my last two poodles & had no problems at all,but have pet set for others that didn’t & one can both see & smell the difference. I don’t believe any animal should be in a crate for any extended time. I would like to know where to buy a snuggle buddy you mentioned! Halo crate trained immediately initially we would close the door . However, we leave the crate door open she comes and goes as she pleases. She lovers her crate it is her safe den. Lately, some days Leo loves the crate and has no problem being in it, but other days it’s like we’re putting him in there for the first time! For the past week, he’s been perfectly content being in there for bedtime. Thanks, everyone, for the comments and advice! 2 days. I just told them mommy had to do errands and would be back as soon as I can. I put in each of my self trained service dogs a toy and a bowl of water. Of course my youngest daughter gave then a large scrap of fleece. The neighbor said they barked for about 30 mins and then they were quiet. They are very smart shi-tzu & Bishon Frishe. I spend my entire day with them. I do the same as I did my children and foster children. I sing them silly made up rhyming songs, & talk to them like my kids. I find that dogs are like children the more time you spend with then & praise then the smarter they are. Thanks for your comment, Cheryl! Wow! just two days? I’m jealous! We’re going on week three this coming weekend.